Today we have a guest blog from Edie Rose. Edie, Fran Denancourt and I are near cousins: my father and Fran’s father had the same mother; Edie’s father and Fran’s had the same father. However, I feel like we are cousins in full because we share family history and a birthplace, Little Rhody. Fran does photos, I do words, Edie does both. Here’s a fine piece that she sent me recently after she moved back to our home state.. Enjoy! The low lying gray clouds threaten rain but I park the car by the Watch Hill Yacht Club anyway and walk toward the dunes. Those less optimistic than I have parked their cars closer to the dunes and others have locked their bikes to the weathered dune fence. Their owners weave through the dunes following paths through the golden grass punctuated with evergreen shrubs and the hurricane-blackened bayberry plants sheltering new green plant growth beneath. I struggle through the soft sand of the path and trip over a nearly submerged “Dune Restoration: Do Not Walk Outside of Path” sign. As I reach the dune crest, a freshening breeze hits my face and tears well up. No, the tears are not due to the breeze but to the sudden sight of a becalmed ocean, its majesty and power hidden by an offshore breeze that has flattened its waves. I run down the slope and hug the water’s edge, tiny waves lapping at my sneakered feet. The beach is a study of neutral colors. 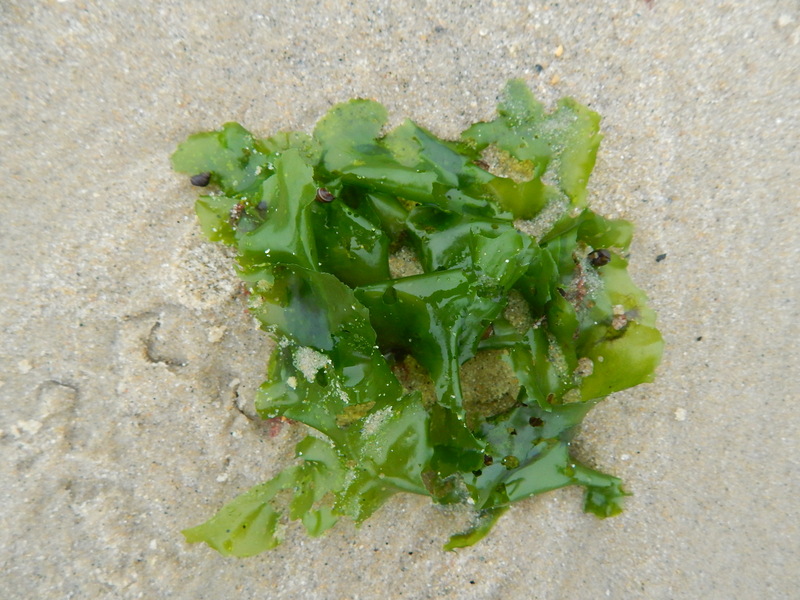 Gray ocean and sky, beige sand, tan grass are the perfect backdrop to the occasional clump of bright green sea lettuce, the dark pink of seaweed, a polished pure white quartz pebble, the purple fragment of a quahog shell. Owners of the cars and bikes continue to move quietly and serenely up and down the two-mile long beach. On I continue, exchanging hellos and contented smiles and occasionally petting a frisky, friendly dog. But I walk alone. What can I share, how can I share this serenity with my loved ones? Ah, yes, my ever-present camera. Click, click. 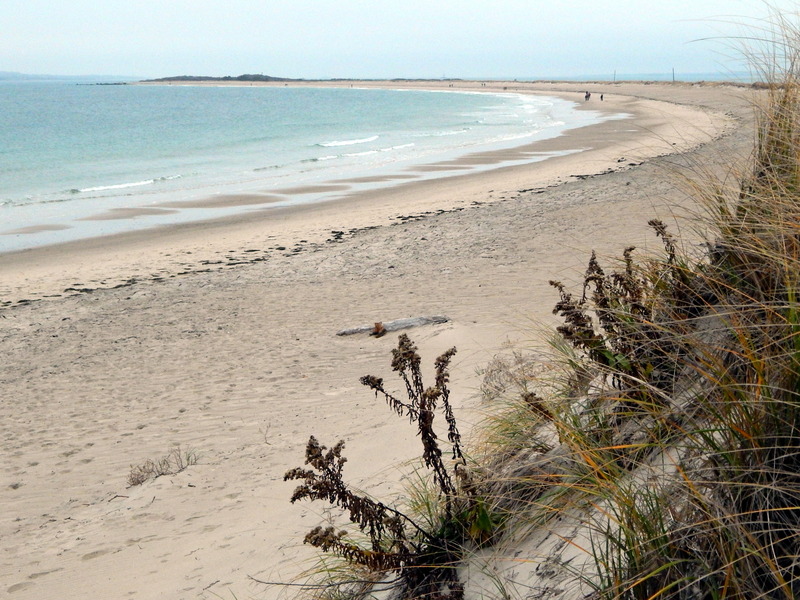 First picture is an overview of the long sand spit reaching out into the becalmed sea. I continue recording the brightly colored seaweed, tree-like patterns, “sand trees,” etched by the last retreating tide. Finally, I rise from my self-appointed task to straighten my aching back. Why are the dark forms ahead moving towards me and no one going in my direction? Suddenly, I know why. I tuck my camera into my coat, put up my hood just as the soft rain reaches me. No complaints, whines, no sounds of disappointment, just a quiet joyous camaraderie as people read the reality of the moment, change direction and steadily head back down the beach. The dogs follow suit, joyously jogging along as the rain increases. The couple ahead of me unlock their bikes from the dune fence, slowly mount and begin pedaling through the puddles in the parking lot. Wonder how far they must go? Sooner than I expect, I have reached my car and behind me a man stops, points at my license plate, “Did you come all the way from Vermont to take a picture of the ocean?” Yes, I reply, I have come home.